Schedule your recordings with built-in recording scheduler, use voice activation to skip silent pauses. 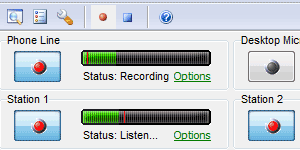 Pefect solution for audio recording wich will record all what you hear. 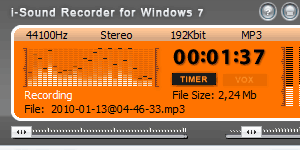 Loopback mode allows you to get bit perfect digital copy of any audio stream. Record up to 16 audio channels on a single PC with multichannel sound cards. Easy to use audio recorder not required special skills and ready to record righ out of box. 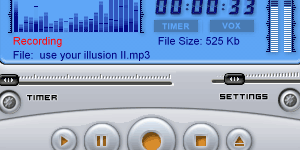 We offer a wide rande of audio recording software desiged for different Windows versions and optimized for different tasks. Our software allows you to record streaming audio, web radio, live shows, voice from microphone, high quality output from external devices like DVD-player. Wish to record from multiple sources? 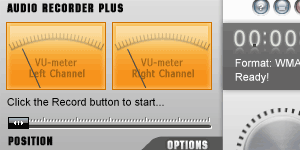 It is not a problem - depending from your sound card our software allows up to 16 recording channels. All software optimized for Windows XP, Windows Vista, Windows 7, Windows 8 and Windows 10. "I had evaluated several audio recorder products and found the i-Sound Recorder to be the best one. The choice was based on good technical performance, feature set, user friendly graphical interface, excellent technical support, and commitment to improvements in future versions. I have used it extensively as an email utility and my friends are very pleased to hear my voice." Take a look on other audio software developed by our company. Fast audio converter with multithreading support. High quality audio effect processor that can change the pitch and tempo of audio file. KEY and BPM detection for Windows.